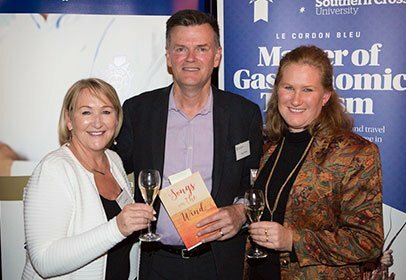 Le Cordon Bleu Australia gastronomy alumni and guests gathered at La Buvette Drinkery in Adelaide’s CBD on Thursday 22nd September 2016 for a reunion event celebrating the Australian launch of graduate Alexandra Gregori's book 'Songs on the Wind'. Special guests included renowned Adelaide food writers David Sly and Simon Wilkinson. Alexandra Gregori graduated with a Le Cordon Bleu Master of Arts (Gastronomy) in 2009 and is currently living in the Philippines. Her book Songs on the Wind is a compilation of essays, articles and poems on eating, drinking, travelling and the lifestyle of one incorrigibly nomadic Australian. The inspiration for the book, her first, began with her gastronomy studies.